Dunnn dunnnn dunnnn daaaa daaaaaa! Have you heard? Maybe you saw it on the Make Blog, maybe you were lucky enough to stumble onto the top secret web site, maybe you’ve been hanging out with us at Ocean State Maker Mill and were in from the beginning. But maybe, just maybe, you haven’t heard about the awesomeness of the Moat Boat Paddle Battle. In that case, here’s the scoop! 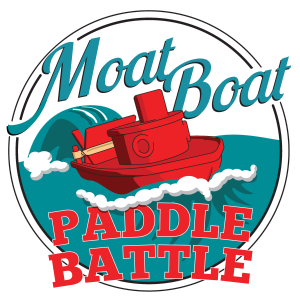 The Moat Boat Paddle Battle (MBPB) is a new competition coming to Maker Faire Bay Area, on May 16th & 17th. Contestants (could be you!) will race their own 3D printed paddle boats against others, drag-race style! Boats can be of your very own design, or you can use one of our sample boats. Not sure what these paddleboats look like? Our intro video shows you the scoop. Hope to see you there for the competition! Be sure to enter ahead of time to participate – sorry we won’t be able to accept walkups. Prizes will be announced soon, and they’re going to be AWESOME! The Moat Boat Paddle Battle is brought to you by Ocean State Maker Mill, Make and the rad folks at SeeMeCNC!